Have you ever got a new pet? And struggled with training it? Joanie and I got our first dog a month or so after we got engaged. He was a beagle mix. We named him Jesse and he and loved to go sniffing and chasing things. We struggled with training him. He was one of those dogs that you didn’t really take for a walk…because you didn’t walk him. He walked you! Now, I was stronger than Jesse, so I kinda did okay dragging him along and dealing with walks that jerked me from place to place. As for Joanie, well she’ll have to speak for herself! The more we tried to train Jesse by pulling and tugging against him to tell him where we wanted him to go (and not go), the more we found ourselves with an untrained dog. Sometime I just felt like that dog Brute force just didn’t work. Eventually, we started trying to understand Jesse…to learn what made him tick. And we found ourselves using treats and incentives and teaching him commands that he could understand. And this took time. We had to get to know Jesse. He had to learn us and we had to learn him. And eventually we got that little beagle pretty well trained. Today, we come across a story where Jesus is dealing with a little demon that no one can seem to control. We read about it in Mark 1:21-28. “Silence!” Jesus said, speaking harshly to the demon. “Come out of him!” The unclean spirit shook him and screamed, then it came out. Everyone was shaken and questioned among themselves, “What’s this? A new teaching with authority! He even commands unclean spirits and they obey him!” Right away the news about him spread throughout the entire region of Galilee. A story about a demon. As I have said to you many times over this past fall, something are not always what you think they are. And this is another case in point. Today we don’t always talk about demons. And folks who do get odd and curious looks. As I have heard most folks talk about demons, they speak of them as literal living beings. Now, I have never seen a demon like that. Maybe you have. But either way, when we talk about demons as only literal living beings, we take power away from this story we read today. We reduce the meaning of the word of God. We flatten the dynamic meaning of this story. We take the wind out of the sail, so to speak. The word demon has gotten a bad rap. Today, it almost always means an evil being. But in Greek, the language of the New Testament, it did not have that same innate evil or negative connotation. The Greek word is δαιμον/δαιμονία (daimon/daimonion). It means spirit, not good or bad, per se. It can be either. In fact, one of the words for happiness is εὐδαιμονία (eudaimonia) which means happiness. A demon is anything that has power that is not of God; anything that has power that is not following the way of God which is made clear in the life and teaching of Jesus Christ. Drugs are demons, demonic, especially the addicting ones. They exert a power over us that is not of God. And if you think about it, many things can become addictive habits: overeating, caffeine, chocolate (I’m guilty! ), hobbies or activities that we get sucked into and cannot pull ourselves out of. Ideas and Ideologies can be demonic when they lead us to think only of ourselves, or talked bad about other people. Governments can be demonic when they become corrupt, when they force people to worship certain ways, when they take more from people than they give. Technology can be demonic when it causes harm to humans beings or God’s creation. Even pastors and churches can become demonic when they begin exerting power over others that is not in line with the way of Christ – when they take freedoms from people telling them who they can spend time with, what they should wear, how they should dress. So demons are lots of things. But they are not beings that magically fly around and go into or out of people. That is a personification of something that is a force in our lives not of God. And while thinking that way can be helpful, we need to be clear that demons are not literal beings. They are not creatures with horns and bodies anymore than leaves dance in the wind, or the wind whispers to the trees, or I look up and see the man in the moon. The language of demons is a way of helping us understand powers in the world that live within us, or take control of us… but even this isn’t the point. In fact, when folks heard Jesus or read these stories about Jesus, their first question was not: What is a demon? Are they real? Because those questions are not the important questions. What is important is what demons do (whether literal or metaphorical). They exert power over us that is not of God. Whether lies or drugs or governments or ideologies or pastors or whatever… demons keep us from our true selves, our true nature … that is they keep us from God, from God’s way, from living the way of Jesus. So we have to watch out for demons in our lives. We have to be vigilant and discening about the world around us. We have to find and discover these powers that control our lives. And we have to name them and do something about them. He calls for it to leave the man alone. Jesus silences the voice of the spirit and then speaks power over the Spirit ordering it to release its control over the man. • Silence the voice, the power, the force that is influencing and controlling you. • Call upon that force to leave you. But here’s the thing: Saying that is a lot easier than doing it. How do you silence the things in your life that have power over you? How do you command them? How do you rid yourself of them? Too often we think we just need the will and the strength to overcome something powerful in our lives. As if we can only rid ourselves of it through strength or brute force. Just like I did for far too long with that little dog, Jesse. But the truth is you can’t command something that you don’t know or understand. In this story, Jesus isn’t effective because he is strong and powerful. He is effective because he has authority. And his authority in this story is linked to his teaching. Jesus is one who knows and understands. And because of his understanding, he is able to speak to this demon in a compelling way. Nothing is easier than to denounce the evildoer; nothing is more difficult than to understand him. 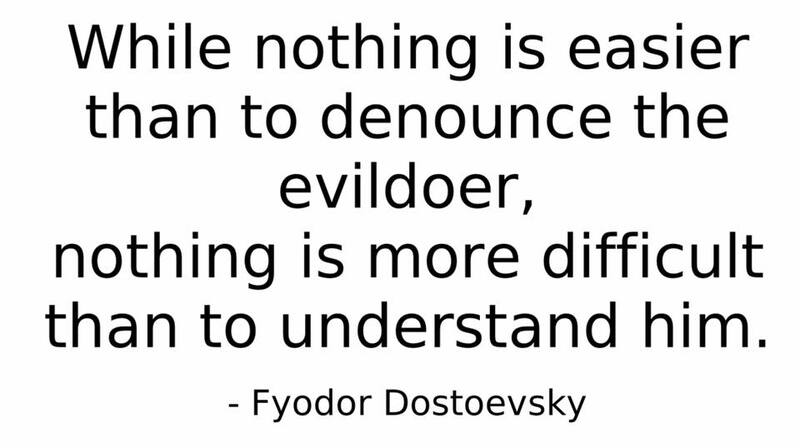 Dostoevsky is right. It is easy to just try to exert our force over something or someone else that we view as evil or wrong or even demonic. But it is much harder to understand it. To understand the force in our life leading us to act or speak or think a certain way. To understand the person with whom we disagree. To understand the group that we think is wrong or the ideology we disagree with. It’s easy to just call it evil or some other name, and then try to force it to bend to our way or even dismiss it. But both forcing someone or something and dismissing it means never taking up the true power in your life. That power is the power to have authority over things that would control us. And you gain authority when you understand those forces in the world that would control you. You have authority when know why things works, when you know the deep reasons a person believes the way they do, when you understand the thoughts and feelings that lead to a particular view or belief that you may not agree with. When you understand something, then you have power – power to speak to it in a language that it recognizes and in a way that motivates it to respond…just like Jesus does in the story today. Brothers and sisters, if you want to discover the power in your life, then you have to be discerning about those powers which are already at work in your life trying to control you and separate you from God. And you have to get wise, studying those forces and learning what makes them tick so that you can speak to them with authority. And that is the real power you have in your life…the power to know, the power to understand, the power to silence the world around you that God might guide your life from here to eternity.